Russian artist Oleg Vassiliev gives memory a voice. Often he begins with a personal memory of his family, a home, a road, even a field. Then he recreates the vision, one that echoes all the more as he experiments with light and space. “Although his painting and drawings start with the specific and the personal, Vassiliev is able to turn those events and images into something universal,” said Natalia Kolodzei, head of the Kolodzei Art Foundation, which has offered longtime support for Russian artists in an era of great upheaval and has amassed a collection of 7,000 works. Some of his works appear political as well as personal. In 1980, Vassiliev created an emblematic cover for Ogonyk magazine that also became a well-known painting. The work portrays a speaker at a Politburo meeting, but Vassiliev obscures the face with a color-suffused intersection of light beams. The effect is startling, and somehow beautiful. But it also evokes the Stalinist-era exorcism of politicians from photographs. They were erased once they fell out of favor, were imprisoned or purged. Ogonyk was shown in the “Russia!” exhibit at the Guggenheim Museum in 2005. A retrospective of Vassiliev’s body of work is currently underway at The Museum of Russian Art (TMORA) in Minneapolis. The museum is a rare space in the center of America devoted to Russian art; the show features new Vassiliev pieces, including recent etchings, as well as those created during the height of the Cold War. “Many of the works for this exhibition are being shown in the United States for the first time, and more than a few are being exhibited for the first time anywhere,” said Kolodzei, who is also lending works for the show. The Russian Noncomformists, as they are called, lived secret artistic lives in their tiny apartments. Occasionally, they had underground shows. Even more rare were visits by foreigners - like the eminent and fearless collector Norton Dodge. Formal exhibitions were mostly out of the question. 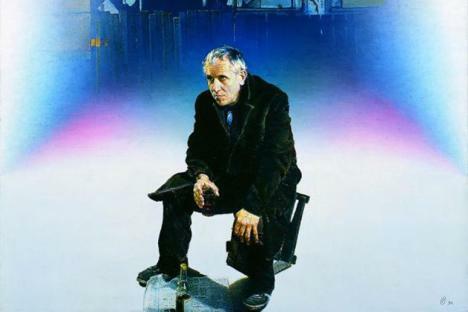 The young Vassiliev did manage to show his work at the Bluebird Café in Moscow in 1968, the same café where his contemporaries Vitaly Komar and Alexander Melamid honed their ironic yet passionate parodies of Socialist Realism, creating a genre that grew up and became known as Sots Art. Vassiliev attended art school in Moscow. Like his friend Ilya Kabakov, he put food on the table with his work as a children’s book illustrator. Only when he immigrated did he make his living as an artist. In recent years, he has sold works for as high as a million dollars at auction. Dozens of artists went into voluntary exile in the 1970s and 1980s, but not all of them fared as well as Vassiliev. There was a heady time when interest in Russia was high, but the passion, for many, also waned. Many of the artists experienced a shock of culture, language and identity. The past is never dead, as William Faulkner said (and Vassiliev painted). Thanks to art, memory survives. Only history will tell how much artists like Vassiliev contributed to the opening and collapse of the system that repressed them. Nora FitzGerald was the Moscow correspondent for ARTnews and is a guest editor for RN.